Hinton Rowan Helper authored "The Impeding Crisis of the South: How to Meet It," which was later banned in North Carolina and across the South. Image courtesy of the North Carolina Office of Archives and History, Raleigh, NC. 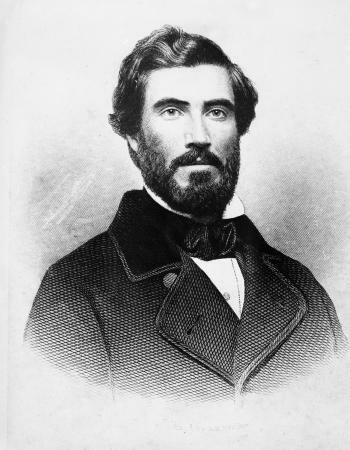 Abolitionist, diplomat, and lecturer, Hinton Rowan Helper was born December 27, 1829, near Mocksville, North Carolina. He was the son of Daniel J. and Sarah Brown Helper. After graduating from Mocksville Academy in 1848, he spent a lifetime unsuccessfully struggling to succeed. In 1850, Helper journeyed to California in hopes of striking it rich in gold mining. His dream ended in failure. He turned his frustration into a book, California Land of Gold: Reality vs. Fiction (1855), wherein he used selective statistics and blasted California as a false “El Dorado.” Helper’s later anti-slavery views were scarcely discernible in this volume, but the book’s intemperate criticism of California and its lax use of statistical data characterized his later work. Helper returned to North Carolina for a period, later moved to New York, and in 1857 he published The Impending Crisis of the South: How to Meet It. This book ranked second only to Harriet Beecher Stowe’s Uncle Tom’s Cabin in its influence for abolition. The Republican Party published A Compendium of the book as a campaign document, and Helper’s work was credited with helping elect Abraham Lincoln. After Lincoln was elected, Helper, asked the sixteenth president for an appointment. Lincoln appointed Helper in 1861 as consul to Buenos Aires, Argentina. There, he met and married Maria Louisa Rodriquez. In 1867, Helper briefly returned to his home state and lived in Asheville as a lonely persona non grata. He later lived in New York, St. Louis, and Washington, D.C. Although opposed to the institution of slavery, Helper was a racist. Numerous times in Impending Crisis he noted that his concern was not for blacks but for “free white labor.” When the freeing of the slaves did not lead to a renaissance for poor whites, Helper became disillusioned and produced Nojoque, A Question for a Continent (1867). He maintained therein that black was “a thing of ugliness, disease, and death… a most hateable thing.” In The Negroes in Negroland (1868), he further elaborated on what he deemed African American inferiority; he quoted such luminaries as David Livingstone, Thomas Jefferson, and even Abraham Lincoln. In his later years, Helper became an unsuccessful railroad promoter and spent significant amounts of time and money promoting an idea for a railroad from Canada to Argentina. Many considered his idea as nonsense. A mentally and financially bankrupt Helper committed suicide on March 8, 1909: he turned on the gas in his drab Washington apartment. Hugh C. Bailey, Hinton Rowan Helper: Abolitionist-Racist (Tuscaloosa, 1965); Hugh T. Lefler, “Hinton Rowan Helper, Advocate of a White America,” Southern Sketches 1 (1935); James W. Wall, “Hinton Rowan Helper” Dictionary of North Carolina Biography (Chapel Hill, 1988) v.3; James W. Wall, “Hinton Rowan Helper and The Impending Crisis” (M.A. Thesis, UNC, 1949).